Abstract : We focus on the challenging problem of simulating thin elastic rods in contact, in the presence of friction. Most previous approaches in computer graphics rely on a linear complementarity formulation for handling contact in a stable way, and approximate Coulombs's friction law for making the problem tractable. In contrast, following the seminal work by Alart and Curnier in contact mechanics, we simultaneously model contact and exact Coulomb friction as a zero finding problem of a nonsmooth function. A semi-implicit time-stepping scheme is then employed to discretize the dynamics of rods constrained by frictional contact: this leads to a set of linear equations subject to an equality constraint involving a non-differentiable function. To solve this one-step problem we introduce a simple and practical nonsmooth Newton algorithm, which proves to be reasonably efficient and robust for systems that are not over-constrained. We show that our method is able to finely capture the subtle effects that occur when thin elastic rods with various geometries enter into contact, such as stick-slip instabilities in free configurations, entangling curls, resting contacts in braid-like structures, or the formation of tight knots under large constraints. 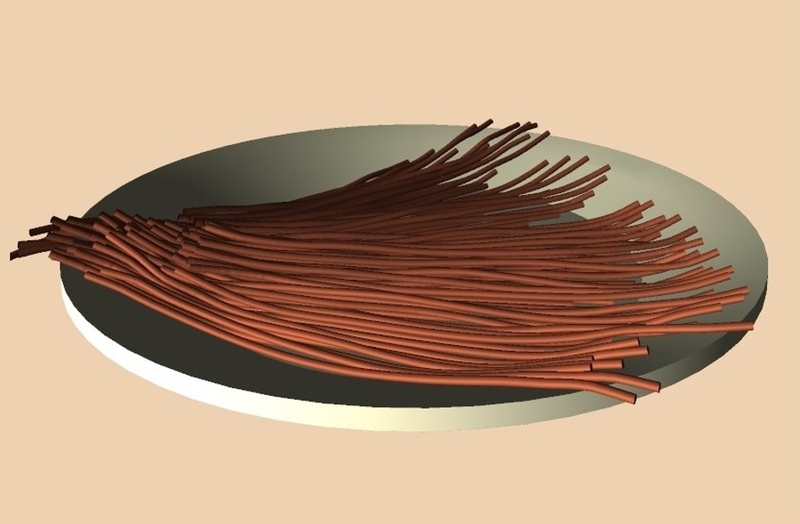 Our method can be viewed as a first step towards the accurate modeling of dynamic fibrous materials.